The actual values after IOSurface and after the colon vary, but the message itself always follows the same model, and while the corruption is occurring, a new message appears in the log every few seconds. I might have hundreds, if not thousands of such messages in my system log on a daily basis. But even on such a corruption-prone web site, I cannot reproduce the problem reliably by simply loading a page from the site. Typically, I need to load a page and then do other stuff in Safari and elsewhere. Eventually, the video corruption starts happening. It’s the same for other sites where the corruption occurs. 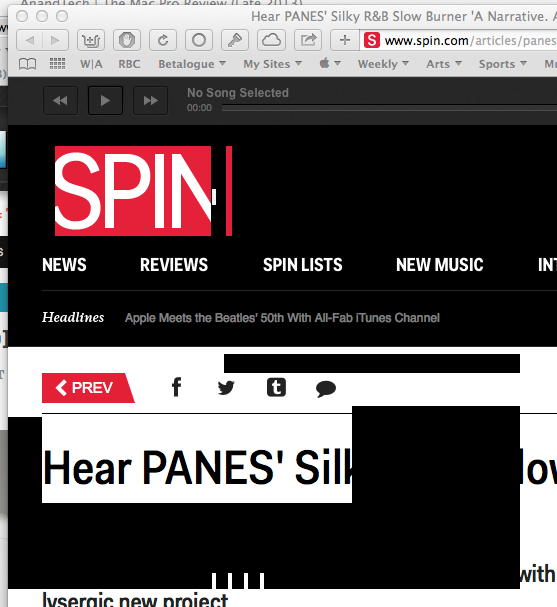 It just seems to happen more readily with the spin.com web site. Needless to say, such a “scenario” for reproducing the bug is not particularly bug-report-friendly. My experience with Apple is that they only really pay attention to bugs that they can easily reproduce. This bug apparently does not qualify. On my machine at least, in my regular user environment, it is still happening as we speak. The video corruption is limited to the side bars on both sides of the video, but I definitely get it every time I load the page. Resizing the Safari window clears the video corruption (most of the time). But reloading the page makes it reappear. I posted about this both on the AppleSeed forums that I contribute to as part of my AppleSeed membership and on my Twitter feed. No one else in the AppleSeed forum seems to be able to reproduce the problem at all, which would seem to suggest that it is limited to certain hardware/software configurations. The main thing that I can think of when I review my own configuration is that it might be related to my use of an ATI Radeon 5770 video card to drive my main display (a 30” Apple Cinema Display). I have a second 30” Apple Cinema Display driven by a separate GeForce GT 120 (one of the two OEM cards that came with my custom-order 2009 Mac Pro), and I haven’t noticed the corruption in Safari windows located on that second screen. I’ve tried all kinds of things to eliminate possible software incompatibilities. 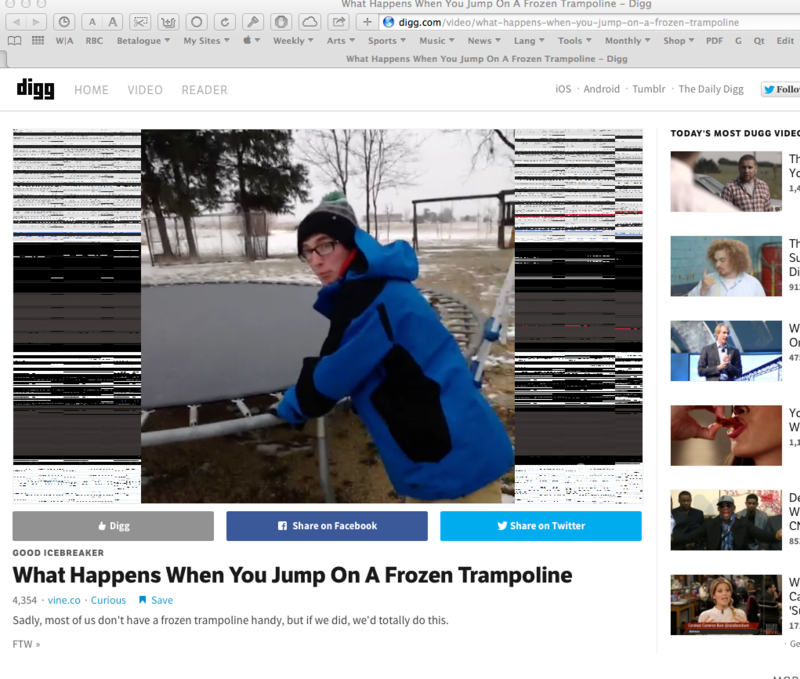 The most conclusive thing that I have been able to do so far is that I can definitely reproduce the same video corruption on that digg.com page in Safari 7.0.2 in a separate user environment that I use for testing purposes, which has very few customizations and background applications running. It has no Safari extensions and no plug-ins other than the ones included in OS X. On the other hand, I cannot reproduce the video corruption on other sites (such as the spin.com web site) as easily in that separate user environment. Admittedly, I haven’t spent hours trying to do so, but the video corruption definitely appears to be easier to reproduce in my regular user environment, with all kinds of Safari extensions and also all kinds of other applications running in the background. One fellow Twitter user has responded that he sees the video corruption on the digg.com web page on his machine as well, which is not a Mac Pro — it’s a Retina MacBook Pro — and does not have an ATI Radeon 5770 card, so the problem does not appear to be strictly limited to the Mac Pro and to the ATI Radeon 5770 card. But clearly, since it does not seem to have come on Apple’s radar yet (in spite of my detailed bug reports), it is not a very common problem. The irony here is that the main reason that I have an ATI Radeon 5770 card in my Mac Pro instead of the second GeForce GT 120 that I originally used to drive the 30” Apple Cinema Display is that there is (was?) a serious bug in OS X 10.8 (Mountain Lion) that would cause frequent and uncontrollable kernel panics on my 2009 Mac Pro with two GeForce GT 120 driving two displays. Now, that particular problem was definitely not limited to me, and many other Mac Pro users with dual monitors had the same issue. There again, it took so long for Apple to even acknowledge the issue, and the kernel panics were so disruptive, that I ended up purchasing and using the ATI Radeon 5770 card as an expensive fix for the problem. Based on what I have heard since, it appears that Apple did finally fix the problem in a OS X 10.8 update (and presumably the bug did not persist in 10.9), but I have not bothered to dismantle my Mac Pro in order to uninstall the ATI Radeon 5770 card and reinstall the second GeForce GT 120 (which I have kept), in order to confirm myself that the kernel panics are a thing of the past and that OS X 10.9 runs fine on a 2009 Mac Pro with two GeForce GT 120 cards driving two 30” Apple Cinema Displays. There are a couple of reasons that I have not done this. First of all, while annoying, the video corruption problem is not bad enough to make me give up. It is definitely not in the same league as the very disruptive kernel panics I used to have with the two GeForce GT 120 cards. And the ATI Radeon 5770 card has twice as much video RAM (1 GB) and provides a small, but not insignificant performance boost in OS X. Now that I am used to it, I don’t really want to switch back to the GeForce GT 120 and experience a noticeable degradation in performance in OS X 10.9. It’s already bad enough that OS X 10.9 has significant responsiveness issues on my 2009 Mac Pro (probably due to its power-saving features, which are fairly irrelevant on a Mac Pro, but cannot be completely turned off) compared to OS X 10.8. I don’t want to see my machine’s performance even further diminished by a video card downgrade. So, what to do about all this? I have already done all I can do to try and provide Apple with reproducible scenarios. If they cannot be bothered to procure a 2009 Mac Pro customized with an ATI Radeon 5770 card (which used to be sold by Apple itself as an Apple-blessed upgrade for the Mac Pro; the Apple Store no longer carries it, but you can still find it at Amazon, for example) to reproduce the problem that I describe in my bug reports, then what else can I do? All I can think of is some kind of attempt to find fellow Mac users affected by the same problem. There is more strength in numbers… So this blog post is an attempt to do just that. If you are experiencing similar problems (video corruption in Safari in Mavericks, not application crashes), I’d love to hear about it. Feel free to contact me using the contact information in the sidebar on the right. This entry was posted by Pierre Igot on Friday, February 28th, 2014 at 5:47 pm	and is filed under Macintosh. You can follow any responses to this entry through the RSS 2.0 feed. Responses are currently closed, but you can trackback from your own site. Next Post: Disappearing cursor in Microsoft Word 2011: Affects .doc documents only?